What kinds of sounds can you find in New York City? With sound-seeker, you can zoom, pan and search for sounds with interactive satellite photos or detailed maps. Click on hot spots to listen to the recorded sounds of a location pin-pointed by gps. 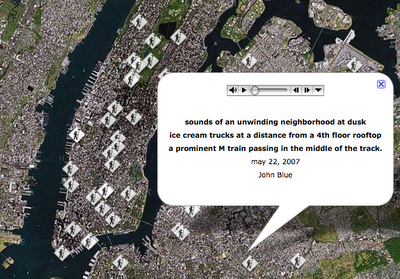 Sound-seeker was created using GoogleMaps and isn't viewable in all browsers. The soundwalk is a practice of focused listening in which one moves through an environment with complete attention to sound. Any environment, at any time of day or night, can provide space for soundwalking. Sometimes the walks are guided by a written or verbal instruction (a "score") and sometimes not. The participants may walk blindfolded, or stand still, or move in response to the soundfield. Sometimes the walker activates the soundscape - "playing along" with the sounds - using the voice, musical instruments or objects encountered along the way. On occasion the walks are recorded and other times they are simply free form ambles through sound filled places. The walks are usually followed by an informal conversation about the experience. There exists a 30-year plus history of soundwalking, particularly among composers who work, either through electronic or acoustic means, with the sounds of natural and built environments. Under the guidance of Canadian composer R. Murray Schafer, a small group of musicians and activists set forth on the World Soundscape Project (WSP) in the early 1970s in an attempt to document and raise awareness of the world's acoustic environments. Myriad related projects, recordings and publications arose from this process. Today, the work of the WSP, with it's legacy of soundwalking, critical documentation and awareness raising, continues to inspire and inform composers, researchers, ecologists and activists across the globe. NYSAE is a membership organization that advocates listening and promotes public dialog about the urban sound environment. NYSAE creates and encourages new ways of encountering sound and provides resources and information on acoustic ecology. Through projects, lectures, performances, exhibitions, festivals, publications and broadcasts, NYSAE addresses historical and contemporary local, national and international sound issues. 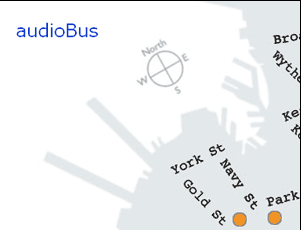 AudioBus B61 is a mapping experiment in the NYSoundmap. It considers the audible landscape of the B 61 bus route through neighborhood sounds in Brooklyn and Queens. We welcome field recordings, readings, conversations, and performances expressive of the many soundscapes along this line of public transportation. Andrea Callard conceived and initiated AudioBus B61 in collaboration with Fred Krughoff and NYSAE members. Jonny Farrow contributed bus movies. People were eyeing your recorder like it was some kind of explosive. Priceless.